← Good Point Mr Oscar Ho; can government-funded art museums achieve ‘greatness’? Brought a friend to Changi Chapel & Museum yesterday (click ‘here‘ for the official site). I’ve been there a few times before and I find the simple, dignifying displays a powerful reminder of how strong the human spirit is. Anyway, we were at the end of the visit when we were looking through some of the books on sale. There was also a small selection of sweets and cold drinks for the tired souls. 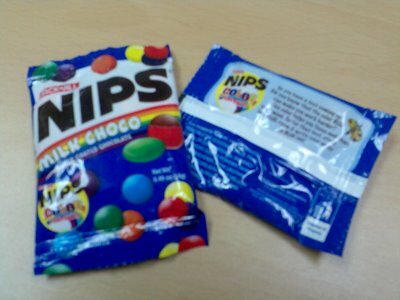 One of the confectionery selections is the pictured milk choco sweets named ‘Nips’. We were as amused as we were offended; ‘nips’ is a derogatory term for a Japanese person (click ‘here‘ for an online definition). Was it intentional that ‘Nips’ happened to be on sale in a museum linked to the memories of the tortured POWs who endured years of hardship under the Japanese? On an unrelated matter, we then drove to the Johore Battery which is just around the corner from the museum (click ‘here‘ for more info). This is the site where huge guns – barrels over 16m long – were manned by the British to repel any invasion. Just last year, the site was still standing, with one gun on display and much of the concrete reinforcements still visible. But yesterday, what I saw was devastating; the site had been turned into a pub of sorts. The gun is still there, but the buildings of the pub had sprung up around it. Score ‘one’ for commercialism and ‘zero’ for historical sites?